We should all be familiar with QR codes, those blocky printed patterns containing encoded text, URLs, or other data. A few years ago they were subject to their own cloud of hype, but now they have settled down in their niche of providing a handy route for a smartphone owner to reach a website without having to type an address. Have you ever wondered how they work? There are plenty of dry technical guides out there, but if they’re not your thing you might find [Nayuki]’s step-by-step guide to be of interest. It explains the encoding and error checking bit generation process before starting on the familiar three-squares pattern and timing bars of the QR code itself. The really interesting part comes with its explanation of overlays, a set of repeating patterns that are added to the final data segment, and how the pattern used is chosen to minimise penalties due to large blocks of the same colour in the final piece. The chances are most of us will never have to create a QR code from scratch, but it is this type of fascinating technical general knowledge that makes guides like this such an interesting read. QR codes have appeared in quite a few projects here over the years, but the one we find particularly amusing is this project to hack them by changing one QR into another. I think when scanning QR codes for URLs, it’s important that the user be shown the key features (such as the FQDN – in Roman characters if there’s a chance of unicode/RTL/alternate trickery) front and centre before they go to the link. It makes me writing basically the same things unnecessary. URL shortening is how the Web will die. This is sooo beautiful! Poses a severe procrastination danger. for example i have small mp3 with one song. How big is qr-code ? beter idea is writing few number or chars directly. Why I woul use 2d code if i can use string? Much like that the little toe is an evolutionary adaption to locate the corners of furniture, the QR codes main purpose in life is to indicate the former location of drivers, apps, or other software necessary to the operation of the clearance Chinesium gadget you just bought. I think that QR codes have a place, for parts, items, and such, but to use them for URL’s/URI’s is subversive to the human-readable nature of what web pages are supposed to be. Incidentally if the center of each bit is marked, the actual square isn’t that important, so as ‘unfinished’ as this one looks, it actually is very quickly readable. What web browser software are you using? Is it an old version of Internet Explorer? I designed my page with a fair amount of compatibility in mind. I tested it to work in IE 11, Edge 42, Firefox 63, and Chrome 70. Your error message suggests that maybe it refuses the XHTML media type. Aside from that, if your browser is old it might not support SVG properly. I am so glad you guys shared this. 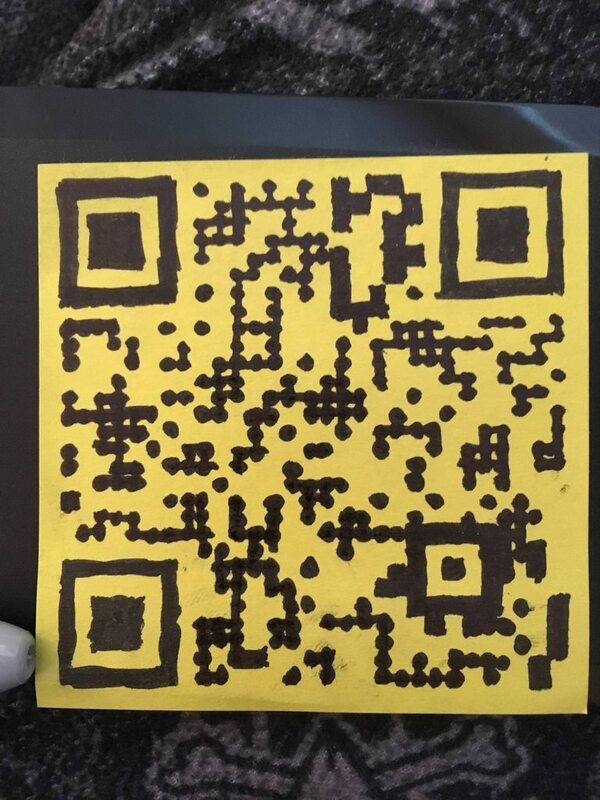 I have wanted to understand QR in this sort of way for a long time now. Would you PLEASE tell my WHY my comment was deleted? Was it the first two words? Now you’ve done it. What did we tell you about coloring outside the lines?